My Readings of Election Results Were Inaccurate: Why? Of course I need to own up to this. Both of the predictions I made concerning election results, based on I Ching readings, were wrong. I inaccurately predicted that Kelly Ayotte would hold onto her Senate seat in New Hampshire and, most notably, I wrote in my most recent blog that Hillary Clinton would take the presidency. Does this mean the I Ching is not such a reliable tool for prognostication after all? Based on the fact I have received mostly valuable guidance from the I Ching for both myself as well as friends and clients over the past 35 years on all kinds of topics, I still trust in its timeless wisdom and capacity to give sincere people the answers they need to successfully navigate life and make the best decisions possible. Readings express probabilities, not declarations of fact. First of all, we really don’t know how the I Ching works. Chinese philosophers have posited that the I Ching faithfully represents in microcosmic form the organization and functioning of their three-part cosmos of Heaven, Earth, and Man. As such, it touches the seeds of future or unseen events that exist in the heavenly realm, and can relate them through readings. However, the answers given in readings are probabilities; there is still a degree of indeterminacy in how events will actually manifest. To give an obvious example, weather reports are not always accurate, especially during times when numerous factors (e.g., geographic features, pressure systems, temperature, wind and water currents) are converging to influence atmospheric conditions. In the case of the Ayotte–Maggie Hassan contest, this race was decided by 1,000 votes. So there was indeterminacy in the heavenly seeds of this situation, which was reflected in the fact that both candidates received so-so readings when I asked about their likelihood of winning. The I Ching’s “final answer” to the question of Ayotte, however, probably provided the ultimate clue: “Misfortune comes.” * But I didn’t interpret this to mean she would definitely lose this election because the hexagram obtained in this reading generally refers to a longer time span, and Hassan’s reading indicated some stagnancy. In other words, this election turned out to be too close to accurately predict. But I don’t have such a handy excuse for missing the outcome of the Clinton–Trump contest. The I Ching’s responses to the likelihood of Clinton winning and the likelihood of Trump winning were both positive. As my question did not specifically state “electoral college,” this symmetry could have reflected the fact that Clinton won the popular vote while Trump won the electoral college. However, I must admit I had a dog in this fight; I did want Clinton to win. So, because her reading more directly addressed the matter of strength, I quickly interpreted that to mean she would be the winner because I wanted it to be so. But, Trump actually had the “better” reading. If my client, whose life I was not invested in or had knowledge about, had received these two readings about a course of action she was considering, I would have steered her in the direction of the Trump reading. For, though the reading began with a declaration of “Decrease,” ** it contained two very propitious messages. The first indicated that Trump would be able to overcome his shortcomings with help and support; the second pronounced “supreme good fortune.” These messages provided the bridge to the final outcome of “The Creative.” This is the first archetypal situation presented in the I Ching, and it represents no less than the original generative power of Heaven. As I stated in my last blog, usually the appearance of The Creative indicates great potentiality, but the rubber has not yet met the road. However, as I mention above, the I Ching can express itself differently in different situations. Here, clearly, it was expressing that the way was open for Trump to take the presidency. The force of Heaven was at his back. So, what have I learned? When The Creative appears in other readings, especially as an outcome springing from positive change lines, I will take greater notice. This is another reason I love the I Ching; there are no masters of this ancient, wise oracle, only students. Likelihood that Trump will win the election: Hexagram 41 (title: “Decrease”) changing to Hexagram 1 (“The Creative”). There were 3 change lines, in the third, fourth, and fifth positions. **Titles vary by translation. For this blog, I use those developed by Richard Wilhelm and Cary F. Baynes in one of the first authoritative I Ching translations to appear in English because they are apt to be most familiar to readers. The I Ching, or Book of Changes, (1950/1967). (R. Wilhelm & C.F. Baynes, trans.). Princeton, NJ: Princeton University Press. Previous Previous post: OK, Who Will Win the Presidential Election? 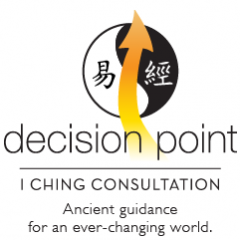 Next Next post: How Can the I Ching Help You Make the Right Decisions in the New Year?